Alumna and art advocate Carolyn Alper’s (center) gift will establish the Alper Initiative for Washington Art. Washington is fortunate to have a thriving arts community. Now, thanks to a major gift from AU alumna and art advocate Carolyn Alper, BA/CAS '68, to the American University Museum at the Katzen Arts Center, more resources will be allocated to the study and exhibition of Washington art. Alper's gift will establish the Alper Initiative for Washington Art at the American University Museum. The initiative will dedicate space for displaying the work of Washington artists, including more tightly focused, historical shows; development of space for archives of Washington art (available for both members of the public and AU students); an endowment to support more programming of events, gatherings, lectures and films; and digitization of AU's growing collection of Washington art. 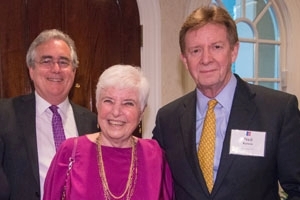 "Carolyn's gift provides American University Museum the funds necessary to elevate Washington art to the place of prominence it deserves," said AU Museum Curator and Director Jack Rasmussen. "All of Washington should be grateful as Carolyn has put her contributions where her heart is." Rasmussen has made Washington art a priority with two "Washington Art Matters" exhibits and opportunities for regular displays of works by Washington artists. A reviewer with Washington City Paper recently wrote: "For almost a decade, the de facto museum of D.C. art has been at American University… The case has been made: Washington art does matter. All we need is the wall space to display it." Five of the six exhibits on display at the museum through Aug. 17 feature Washington artists and collectors: Mynd Alive by B.K. ADAMS/I AM ART; Syzygy by William Newman; Continental Drift (Being Here and Being There) by Judy Byron; Passionate Collectors: The Washington Print Club at 50, with prints curated from Washington collections; and The Franz and Virginia Bader Fund: Second Act, with art by grant recipients from the region.